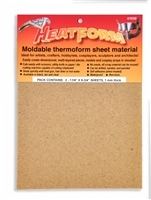 HeatForm™ is an innovative, heat-activated thermoplastic sheet material. When heated, it becomes soft and pliable, which allows it to be shaped and molded into simple or complex shapes. Its self bonding characteristics makes it easy to fuse pieces together for a seamless finish. 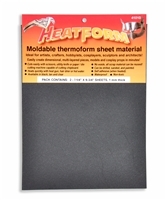 Once cooled, HeatForm becomes semi-rigid, yet durable and locks into it’s new shape. Ideal for artists, crafters, hobbyists, cosplayers, sculptors and architects! Create dimensional, multi-layered pieces, models and cosplay props in minutes! 1mm thick x 7.25" x 9.75"